Neumark calls her work a form of “conscious capitalism,” in which the company’s $30 million in annual business can make a difference in the social movements she cares about. At first glance, the SoHo-based catering company Great Performances comes across as any number of polished party planners promising the event of a lifetime. Its Web site is decked out with gorgeous food photography and its client list includes some of the city’s top cultural, philanthropic and business institutions. Dig a little deeper, though, and a more full-bodied picture emerges. There’s the company’s own organic farm upstate, for instance, or founder and CEO Liz Neumark’s blog, which covers such topics as the National Food Policy Conference in Washington and the state of CSAs in Maine and Florida. Read on and you’ll find that over the past 35 years, Neumark has woven a complex tapestry of achievements in business, community service, sustainable agriculture and education. 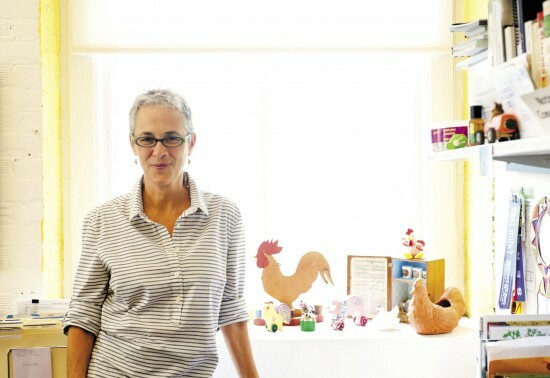 Her endeavors encompass Great Performances’ 23,000-square-foot headquarters on Hudson Street, the 60-acre organic Katchkie Farm upstate, the Sylvia Center (an educational nonprofit dedicated to teaching kids about sustainable farming and healthful cooking) and a line of artisanal products from ketchup to pickles. Her just-released book Sylvia’s Table: Fresh, Seasonal Recipes from Our Farm to Your Family is both farm-forward and city-sophisticated, featuring recipes for everything from DIY fish sticks to watermelon-mint salad to roast duck. Neumark calls what she does a form of “conscious capitalism,” in which GP’s over $30 million in business a year gives her the clout to make a difference in the social change movements she cares about, and brings a practical approach to the nonprofit boards she sits on, including the Sylvia Center, GrowNYC, Just Food, the Women’s Forum New York, the Governor’s Food Policy Council and the Hudson Square Business Improvement District, plus the advisory boards of the West Side Campaign Against Hunger; Food and Finance High School; and Barnard’s Athena Center for Leadership Studies. GrowNYC executive director Marcel Van Ooyen, whose programs include the city’s 60- plus Greenmarkets, calls Neumark “almost a spiritual guide” in the example she sets of integrating social activism into her business. “She’s a great mentor when it’s time to figure out those triple-bottom-line activities” that make a profit while benefiting people and the planet. To understand how Neumark became both a catering titan and a leader in New York’s sustainable food movement, you have to know about her upbringing. Growing up on the Upper West Side, multi-generational Friday night family suppers usually featured notables from the synagogue or community, performances or speeches by each of the four Neumark kids, and a groaning table. “If there were 12 people coming for dinner, there was food for 20,” recalls Neumark, a petite woman in her mid-50s who wears seafoam-colored eyeglasses and is preternaturally youthful, relaxed and focused. Neumark majored in urban studies and political science at Barnard, then set her sights on becoming a documentary photographer. Life took a different course, though, when the little side business she launched in 1979, providing temporary waitstaff work for women in the arts, morphed into an instantly successful, fast-growing catering business. It “was not supposed to succeed,” and by doing so “it was the great failure,” she says. Today Great Performances sets the table for clients ranging from individuals who want to stage an intimate dinner party for four to august cultural institutions and landmark venues such as the Brooklyn Academy of Music, Jazz at Lincoln Center, Wave Hill and the Plaza Hotel. Her life, Neumark says, has come full circle: back to the issues she studied at Barnard and those earliest days of food as community at her grandparents’ table. Only now, “dinner” is of a different order of magnitude, often a logistical and planning challenge that, viewed from behind the scenes, resembles a military campaign more than a festive gala. On a recent evening, GP-catered events—usually averaging 20 to 30 a day, according to GP president Dean Martinus—included a dinner for 865 at Jazz at Lincoln Center, a 1,400-guest cocktail buffet at the Plaza Hotel for the East Coast premiere of The Great Gatsby (featuring period-inspired foods). At 7:30 p.m., in a cavernous converted recording studio at Jazz at Lincoln Center, a team of quietly intent kitchen assistants preps the first course: a salad of white and green asparagus, morel mushrooms and sherry vinaigrette. Against the walls, rows of Sterno-equipped “proofing cabinets” stand by to warm the bourbon bread pudding. Overseeing the preparations is Mike Deuel, the GP executive sous-chef in charge of all off-premises events. “This is the fifth event site I’ve been to since 5 o’clock,” Deuel reports. His kitchen staff for this event includes four chefs and 21 kitchen assistants. The gala will commence after the performance in the adjacent Rose Theater. In one of two main dining areas, a team captain gives a pep talk to his black-clad servers, coaching them on the finer points of silverware placement. When guests start filtering out of the theater, the salads have just been garnished tableside with micro amaranth and mizuna. Members of tonight’s 180-member-strong waitstaff stand at attention next to each table, ready to offer arriving guests bread and wine. an event in 1986 that tested her three-month-old marriage to Chiam Wachsberger, a lawyer she met on a blind date. It was for the re-opening of the Statue of Liberty and part of the festivities involved back-to-back parties on the Staten Island ferries. After making countless urns of coffee for 12 hours, Neumark’s stunned husband told her that being in the army was an easier job. While tonight’s gala guests see the public face of Great Performances—the carefully choreographed service, a soigné local menu (featuring pan-roasted sea bass with fingerling potatoes, artichoke, fennel and a caperberry-tomato tapenade) and centerpieces of a special tulip florist David Beahme developed with a Dutch flower broker and named after Wynton Marsalis—GP’s SoHo headquarters is the heart of the operation. In the GP kitchen, Matthew Riznyk, executive chef for catering, threads through a cacophonous, churning hive of activity, where dozens of white-jacketed, black-capped workers carry out the day’s marching orders. Those are printed out with GP’s trademark attention to detail, with separate sheets for each of 10 color-coded “teams,” plus the butcher, pastry, saucier and purchasing departments, Riznyk explains. On the day of the jazz benefit, teams are prepping for events ranging from a 60-guest financial management firm dinner to a 600-guest event for the Harlem Village Academies. With Spanish-language radio and the loud whirring of a massive handheld Bermixer—resembling a jackhammer more than a blender and half the size of the worker using it to churn a batch of squash soup—as the sonic backdrop, a cook is frying up GP’s signature beet chips, a deep garnet color and intoxicatingly salty-sweet. Around a tight corner, another assistant brushes butter on trays of bread for tomato-bacon grilled cheese sandwiches while his neighbor assembles “ravioli” made of thinly sliced beets filled with herbed goat cheese. The blue team is tasked with skewering 525 mahi mahi kebabs. The butcher team braises 500 beef short ribs, while the pink team prepares 600 pieces of spanakopita. All this is just a fraction of the day’s production. It’s not just events they are cooking for; the company also runs food service operations for nine venues, ranging from the BAM Café to El Café at El Museo del Barrio and Sotheby’s Terrace Café. Because of this, the kitchen is in operation nearly round the clock. Some Katchkie produce comes here, but that harvest also goes to 600 community center and workplace CSAs and is sold at the Wednesday Greenmarket at Rockefeller Center. Much of GP’s event produce comes from Katchkie’s neighbor Roxbury Farm, Long Island–based Satur Farms, the Greenmarket and GrowNYC’s new wholesale operation, which delivers farm products both to bigger buyers like restaurants and retail outlets throughout the city. Tim Sullivan, GP’s executive chef for venues, says one of his favorite creations is a dish he developed for the club at Lincoln Center: ratatouille with Katchkie Farm squash blossoms stuffed with local goat cheese. “We were able to pick up zucchini, onions and squash blossoms at the farm in the morning, stop to pick up the goat cheese, and were back in Midtown by 4:00 p.m. preparing the dish,” Sullivan says. Neumark and GP have instituted green practices in the kitchen and throughout the company, collecting kitchen compost to take to Katchkie Farm. And in an inspired bit of engineering, Katchkie farmer Bob Walker figured out how to set up a greenhouse heating system that runs on used cooking oil from the GP kitchens; he recycled about 2,000 gallons of oil between November and February. Schooled in biodynamic farming, Walker met Neumark through a farmer friend in 2006. Twelve hours after he e-mailed Neumark his résumé, he was having breakfast with her and Martinus at a diner off the Taconic Parkway. “I knew Bob was the one, even before I’d finished my oatmeal,” Neumark recalls. Since then, Walker has overseen the building of a barn, greenhouses, shop, fences and the laying of 40,000 feet of irrigation pipe in the ground. A year after Neumark bought the farm, Katchkie (the nickname of Neumark’s son, Sam) yielded its first harvest. Even as she turned tragedy into a force for social good, Neumark has had to keep her company competitive in an increasingly crowded catering market. Some ingredients come from Neumark’s own Katchkie Farm. The catering kitchen gives back too—in the form of used cooking oil that powers the greenhouse. Vice president/director of sales Linda Abbey, a former aspiring Broadway actor who has been with the company since its inception and who now alone handles $2.75 million of business a year, says her clients are aware and interested in the food movement: some enough to be talked out of serving asparagus in December; some enough to request more expensive grassfed beef for their protein choice. Abbey was touched, though, when her husband was dying of cancer 10 years ago and Neumark “went with us to every single doctor’s appointment.” Neumark treats her staff like family, officiating at Riznyk’s recent wedding, taking the staff of Jazz at Lincoln Center to a midnight showing of the latest Batman movie, or letting anyone who needs a place to crash stay at her Upper East Side apartment. The company’s growth continues: In September, GP will help open and operate a culinary center housed in a brand-new Battery Park City building run by Asphalt Green and dedicated to fitness. GP’s center will offer cooking classes that emphasize seasonality and sustainability. From a single great idea—giving women in the arts a source of income while they pursue their dreams—Neumark has built a community and a food universe of proportions she herself could never have imagined, stretching from a wedding at the Plaza Hotel to harvesting beets at Katchkie Farm to teaching knife skills to seven-year-olds in the Bronx.